1993 (MCMXCIII) was a common year starting on Friday of the Gregorian calendar. January 1 – Czechoslovakia divides. Establishment of independent Slovakia and Czech Republic. January 3 – In Moscow, George H. W. Bush and Boris Yeltsin sign the second Strategic Arms Reduction Treaty (START). January 5 – Washington State executes Westley Allan Dodd by hanging (the first legal hanging in America since 1965). January 9 – Jean-Claude Romand kills his family and tries to burn himself with his home in France. January 18 – For the first time, Martin Luther King Jr. holiday is officially observed in all 50 United States states. IBM announces a $4.97 billion loss for 1992 which is the largest single-year corporate loss in United States history. Iraq disarmament crisis: Iraq refuses to allow UNSCOM inspectors to use its own aircraft to fly into Iraq, and begins military operations in the demilitarized zone between Iraq and Kuwait, and the northern No-fly Zone. US forces fire approximately 40 Tomahawk cruise missiles at Baghdad factories linked to Iraq's illegal nuclear weapons program. Iraq then informs UNSCOM that it will be able to resume its flights. January 20 – Bill Clinton succeeds George H. W. Bush as President of the United States of America. A gunman kills two employees outside CIA headquarters in Langley, Virginia. February 11 – Janet Reno is selected as Attorney General of the United States. February 17 – A ferry sinks in Haiti, killing about 1, 200 out of the 1, 500 passengers on board. February 24 – Canadian Prime Minister Brian Mulroney resigns amidst political and economic turmoil. February 26 – World Trade Center Bombing: In New York City, a van parked below the North Tower of the World Trade Center explodes, killing 6 people and injuring more than 1, 000. February 28 – Bureau of Alcohol, Tobacco and Firearms agents raid the Branch Davidian compound near Waco, Texas, with a warrant to arrest leader David Koresh on federal firearms violations. Four agents and five Davidians die in the raid, and a 51-day standoff begins. March 5 – Macedonian Palair Flight 301 crashes after take-off in Skopje, killing 83 out of the 97 people on board. March 12 – Several bombs explode in Bombay, India, killing 257 people. March 24 – The Israeli Knesset elects Ezer Weizmann as President of Israel. March 27 – Jiang Zemin becomes President of the People's Republic of China. April 16 – Bosnian War: Srebrenica falls. April 19 – A 51-day standoff at the Branch Davidian compound near Waco, Texas, ends with a fire that kills 76 people, including David Koresh. April 23 – Eritreans vote in favour of independence from Ethiopia. April 27 – All members of the Zambian national football team die in a plane crash near Libreville, Gabon. May 1 – Former French Prime Minister Pierre Beregovoy commits suicide. May 9 – Juan Carlos Wasmosy becomes Paraguay's first democratically elected President in almost 40 years. May 28 – Eritrea and Monaco are admitted to the United Nations. June 5 – 24 Pakistani UN peacekeeping troops are killed in Mogadishu, Somalia. June 25 – Kim Campbell becomes Canada's first female Prime Minister. July 2 – An integrist mob sets fire to a hotel where The Satanic Verses translator Aziz Nesin resides, in Sivas, Turkey, killing 37 people. July 26 – Asiana Airlines Flight 733 crashes into Mt. Ungeo in Haenam, South Korea, killing 68 people. July 31 – King Baudouin I of Belgium dies aged 62. August 9 – King Albert II of Belgium is officially sworn in. August 13 – Over 130 people die in the collapse of the Royal Plaza Hotel in Nakhon Ratchasima, Thailand. 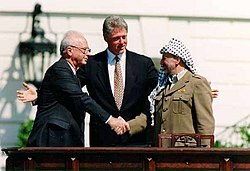 September 13: Israeli Prime Minister Yitzhak Rabin, US President Bill Clinton, and PLO Chairman Yasser Arafat sign the Oslo Accords. 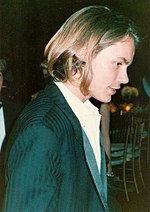 September 6 – The first reference to the Year 2000 problem is made. September 13 – Gro Harlem Brundtland is reelected as Prime Minister of Norway. September 13 – PLO leader Yasser Arafat and Israeli Prime Minister Yitzhak Rabin sign a peace accord. September 23 – Sydney, Australia is awarded the 2000 Summer Olympics. September 30 – An Earthquake centred in Killari, Maharashtra, India kills more than 10, 000 people. October 2 – The Russian constitutional crisis of 1993 culminates with the Russian Military and security forces clearing the White House of Russia parliament building, squashing a mass uprising against President Boris Yeltsin. October 3 – A large scale battle erupts between US forces and local militia in Mogadishu, Somalia, killing 18 Americans and over 1000 Somalis. October 10 – The ferry Seohae capsizes off Pusan, South Korea, killing 292 people. October 21 – A coup in Burundi results in the death of President Melchior Ndadaye. October 25 – Jean Chretien of the Liberal Party is elected Prime Minister of Canada. October 31 – movie director Federico Fellini dies aged 73. November 1 – The Maastricht Treaty takes effect formally establishing the EU. November 9 – Bosnian Croat forces destroy the Stari most, or Old Bridge in the town of Mostar, Bosnia and Herzegovina by tank fire. November 22 – The NAFTA is passed. December 2 – Colombian drug lord Pablo Escobar is gunned down by police. December 20 – The first corrected images from the Hubble Space Telescope are taken. December 30 – Israel and the Vatican establish diplomatic relations. December 30 – The Congress Party gains a parliamentary majority in India. December 31 – Georgian President Zviad Gamsakhurdia dies aged 54. "Man On The Moon" – R.E.M. This page was last changed on 25 March 2019, at 01:38.